To purchase the following collections go to mymusicfix.com and click on monthly featured collections located on the home page, or call (949) 454-8577. Note: shipping may vary according to the size of the collection, please email mymusicfix2@msn.com for shipping rates. 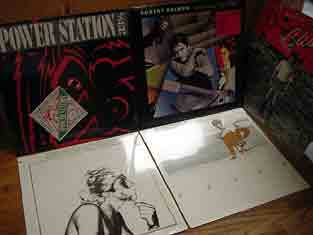 5 LPS - THE POWERSTATION, ADDICTIONS VOLUME I, SECRETS, CLUES and PRIDE - All are Long Out Of Print and Factory Sealed Classic Analog LP Pressings with a small Cut Out in the Cover. These are the last analog pressings from the eighties. I'LL BE HOME FOR CHRISTMAS Rare 10" LP made in the U.K. with tracks of Santa Claus Is Back In Town, White Christmas, Here Comes Santa Claus, I'll Be Home For Christmas, Blue Christmas, Santa Bring My Baby Back, O' Little Town of Bethlehem and Silent Night. 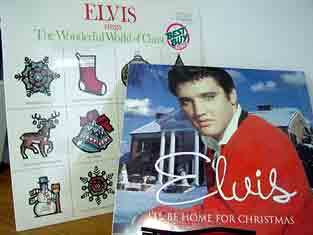 ELVIS SINGLES THE WONDERFUL WORLD OF CHRISTMAS is an Out of Print Analog Sealed RCA LP with a small Cut Out in the Cover. Recorded in 1971, this LP includes the following tracks: O' Come All Ye Faithful, The First Noel, On A Snowy Christmas Night, Winter Wonderland, The Wonderful World of Christmas, It Won't Seem Like Christmas, I'll Be Home On Christmas Day, If I Get Home on Christmas Day, Holly Leaves & Christmas Trees, Merry Christmas Baby and Silver Bells. These Twelve Titles are the original LPs before being chosen to press by the Audiophile companies MFSL, DCC and Nautilus: Blood Sweat & Tears/ST, Boston/ST, Jeff Beck/Blow by Blow, Michael McDonald/It Takes What It Takes*, Ambrosia/Life Beyond L.A., John Mellencamp/Lonesome Jubilee, Roy Orbison/Mystery Girl, Jim Croce/Greatest Hits, Tears for Fears/Songs From The Big Chair*, Boston/Third Stage, Robert Cray/Strong Persuader, and The Cars/Greatest Hits. This Collection will give any vinyl enthusiast an assortment of LPs that will bring to light why these titles are considered Sonic Gems and were all pressed by the audiophile companies. MFSL, DCC and Nautilus only utilized various labels producing artists who were considered audiophile-engineered masterpieces. Each LP's sonic separation and clarity of each instrument and voice were instrumental to their selection for pressing by these audiophile companies. 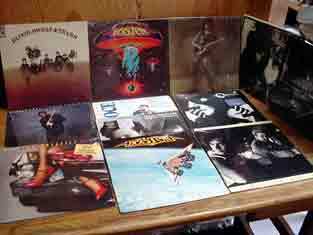 This is your opportunity to screen each of these pressings or transfer your existing used LP for a sealed copy. Each of these LPs is available in their audiophile pressing by visiting Mymusicfix E-Bay STORES. You will be one of the last in the world to own these Long Out of Print LPs and gain the experience of understanding why these Audiophile Pressings sell for over $100 by MFSL or DCC. *Some of these LP jackets have a cutout mark and are noted by an asterisk next to their title.